Like most teachers, I spent a little time this summer filling out my lesson plan books. However, if you look carefully at the photo above you might notice that my lesson plan book is a little more BLANK than a traditional teacher's book. Because Montessori students choose their own work every day I will fill in the squares until after my boys have done their work rather than before. It is a "work journal" not a "lesson plan book." 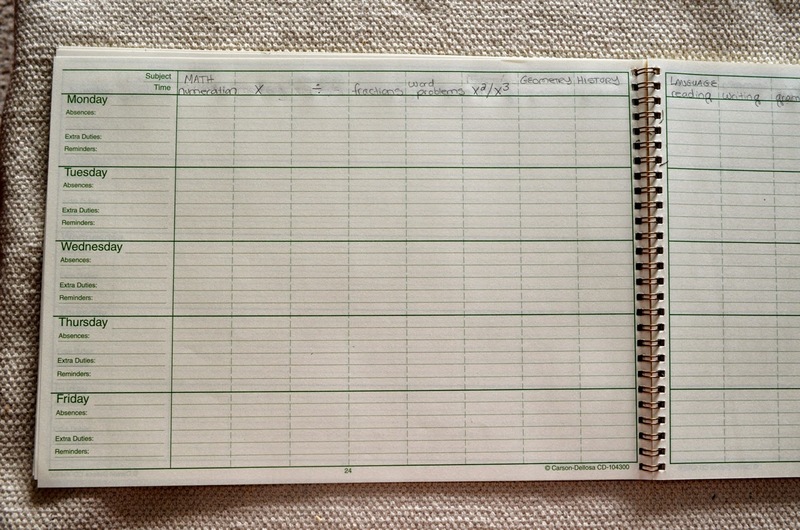 In a traditional Montessori elementary environment.the work journal is one of three essential tools that balance the freedom of cosmic education with responsibility. Confession: At the time of this posting I keep the work journal, not the boys. 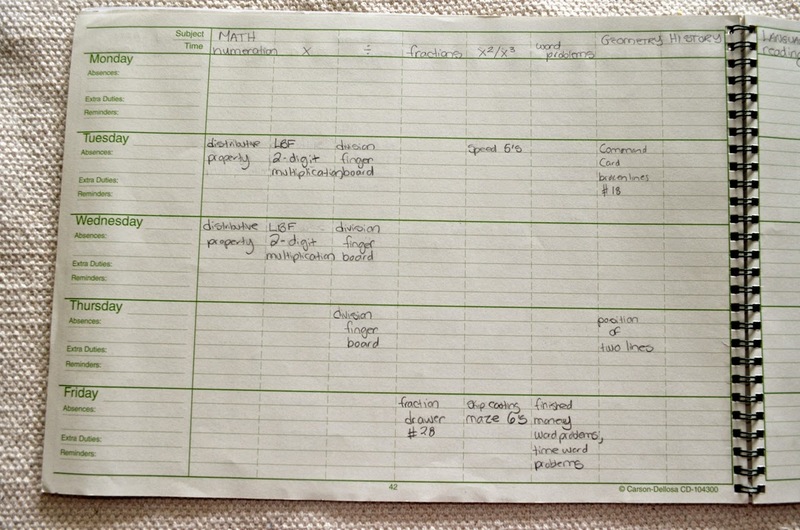 In a traditional Montessori elementary environment the CHILD fills in the work journal, not the guide. Yeah. I know. I'm not utilizing one of the three ESSENTIAL tools. 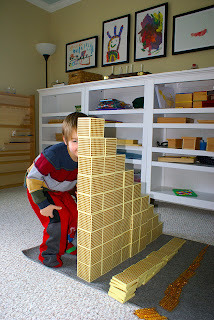 Once again I am grateful that there is no such thing as the "Montessori Police." So why don't my boys journal? 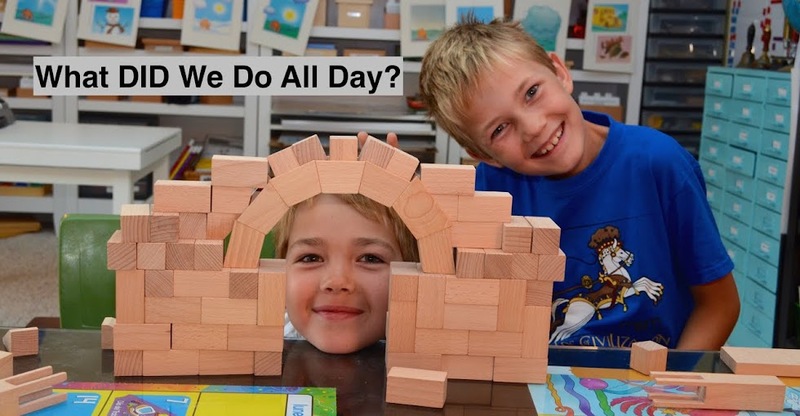 My main concern is that we spend far fewer hours in our "formal" Montessori environment than a Montessori student at a traditional Montessori elementary school. A traditional student would be at school all day five days each week. 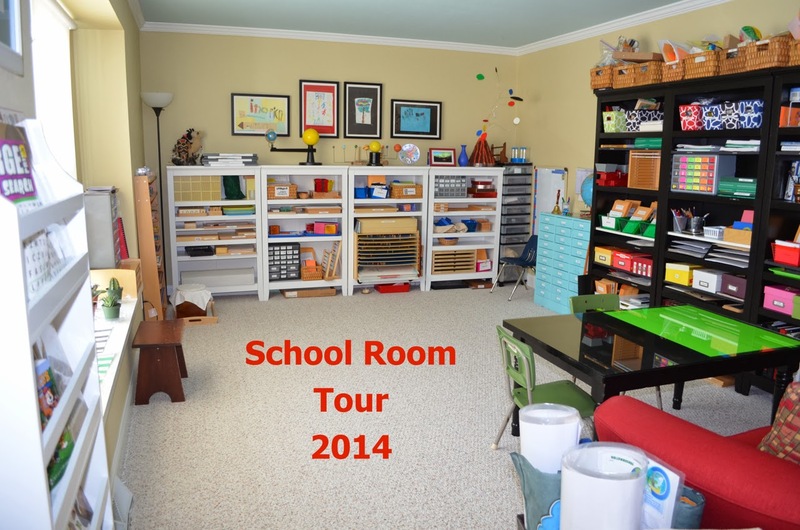 We are typically in our "school room" four days a week from 9 to noon. When Kal-El is accomplishing careful and thoughtful work similar to what is expected in a work journal it takes A LOT of time. We wouldn't be able to get enough work done with the Montessori materials if Kal-El spent half of his time journaling what he did. Another concern is that the boys step into the school room on their own frequently outside of "school hours" and both are reluctant writers. I don't want them to think that "if they do work" they "have to write it down" and stop doing extra work to avoid journaling. Another big concern is that we spend a lot of time learning outside the school room. In my mind we homeschool all day, every day. I haven't figured out how that translates to a child's work journal. The guidelines of "what to journal" in the Montessori Guide article linked above is very clear that the child journals everything: their work, their "down time," when they leave the classroom for appointments, etc., Can you imagine doing that every day, all day, at home rather than just at school during school hours? Obviously one wouldn't. That opens a new can of worms: what to journal and what not to journal. I'm not comfortable defining our activities as "journal-worthy" or not "journal-worthy." If we spend an hour baking a pie and don't put it in our journal does it become a less-valuable learning experience than working on division with the racks and tubes? Of course not. But if you train your child to record one or not the other might they start applying such value-judgments themselves? Anyway, enough about why the wrong person is keeping the journal. Let's just look at the journal, shall we? 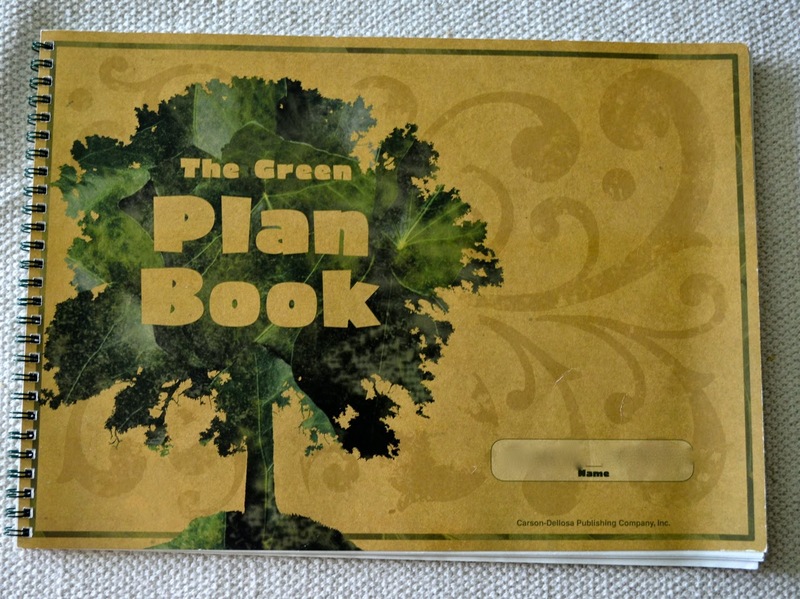 I very specifically like these lesson plan books from Carson Dellosa called "The Green Plan Book". 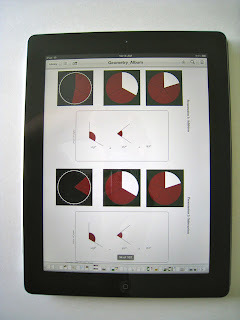 I like it because it is in landscape format, very few lesson plan books are. Lesson plan books in portrait orientation don't have enough columns for the amount of "threads" we have in Montessori. This landscape book has 18 "subject" columns. If you would like something similar for yourself and don't want to buy the Carson Dellosa, My online friend Tracey from Dream Before You has made a printable download. As always, my photos will enlarge if you click on them. I also like the blankness of this book. Some other books have a lot of things, like subject headers or dates, "helpfully" filled in. This book also is one of very few that has dashed rather than solid lines separating the columns. This is handy for Montessori. The number of threads you are working in and the amount of work you are doing for particular threads will change from month to month. It's nice to merge two columns into one when you are working with fewer threads and doing a lot of work in a particular thread. We always seem to need all of the columns all the time lately. However, the dotted lines is very spillover-friendly when I have a lot to write in a particular column. Me Too and Kal-El each have their own book. The list of threads at the top changes throughout the year and is often different for each child. To give you an idea of what my work journal looks like at the end of the week, I randomly chose a week in Kal-El's book from last year. Below are pictures of each page for that week (left and right) so you can see how I fill it out. Our work plans keep the boys moving along pretty consistently across most of the threads. However, because they choose their own work not every thread is touched every week. In the week above it looks like we didn't manage to do anything out of the history album or the zoology portion of the biology album. Blank columns like that help me guide because they tell me that those threads need a little kindling in the form of a presentation the following week. Columns that filling in well are either humming along nicely on their own or I've been consistently giving presentations. I usually am ready to give the next presentation in any thread because I keep track of them on a chart. The companion to the work journal for me as the guide is my planning clipboard. My clipboard holds four sheets of paper on which I have printed these charts. 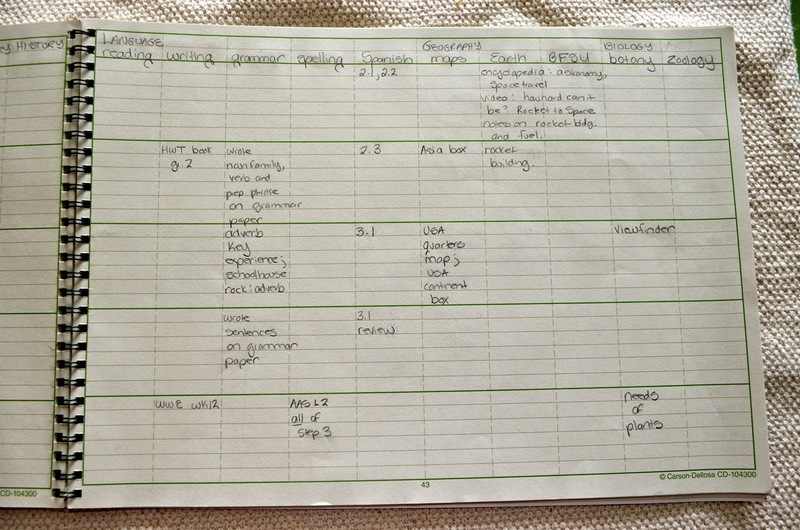 Basically I needed three-column charts with about five rows per page. This gave me enough room to write. Each row is for a different "thread" in our cosmic curriculum. The first column is for the thread name. I happened to pre-print my thread names, but one could just leave that column blank and write them in because they do change from time to time. The second column is a list of the next THREE presentations following our current place in the album/thread. When I record things in this column I make sure I understand the procedure for giving that presentation. 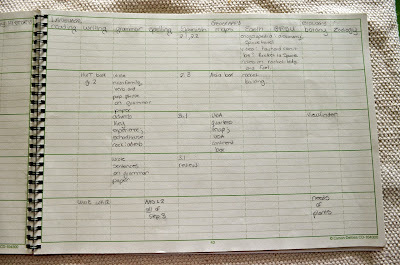 The third column is where I record any materials I need to fetch from the basement or make. You can see that there are check marks on the right-hand side from when I checked off that the materials were prepared. A wavy line is sometimes used to divide a row in half when the boys are in different places along that thread. 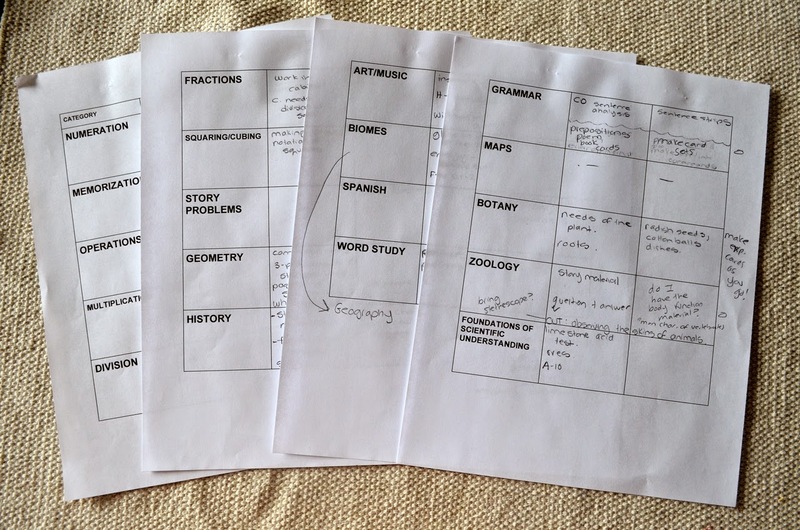 In this way, I make sure I am prepared for the next three presentations for each child in each thread. It's like an "assignment notebook" for me as the guide. I make sure I am physically and mentally ready to move forward along any thread my children choose or that I choose for them. If you give an interested child a presentation and watch that flame ignite there is nothing worse as a Montessori Mom than to have them ask "what's next" only to realize you can't show them because you haven't prepared the material or don't remember how to use it. Yuck. I use each chart for several weeks at a time. When I give a presentation I just cross it off and add a new one to the list if there is room. When I run out of room I print a new chart and keep going. 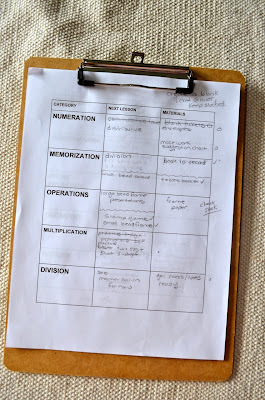 The work journal and planning clipboards (maintained by me) work in tandem with the work plans that the boys use to keep us moving forward in all areas in our homeschool. I plan to post about the boys' work plans very soon. You will see that they double as a VERY simple work journal as well, albeit an impermanent one. Perhaps I will find a way to reconcile the concept of a child-kept work journal with our homeschool sometime in the future. If I do, I will blog about it. 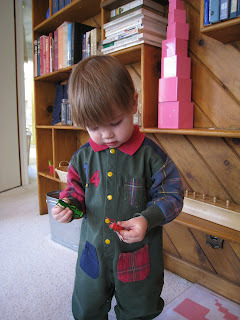 I encourage you to read "The Three Essential Tools" at Montessori Guide. It is a great post. Read it and decide for yourself how the three essential tools will look in your homeschool. School-wise, he might write "multi-base 10" and that's it. 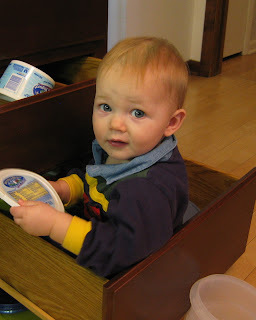 When he was younger, more was useful to show what he did and what questions he had, what he planned to do with it next. Now that sort of information is kept elsewhere (depending on the subject). At various times, we have only really required the noting of anything that was on the "plan", with additional optional notes for anything else done in the day. I knew I could count on you to leave some practical comments on how to make it work. Thank you! I always think of you and wince a little bit when I write these posts. I'm like the "poster mom" for your course and here I go again, not doing what I'm told. Sorry :( SUCH a bad example. I always think "poor Jessica" when I post about stuff like this. Probably causes you a lot of work clearing things up when I'm done. Thank you for sharing more options!!!! I love the idea of you using the planner as your own journal. I have been thinking on doing the very same thing (not to sound like a big copy-cat). 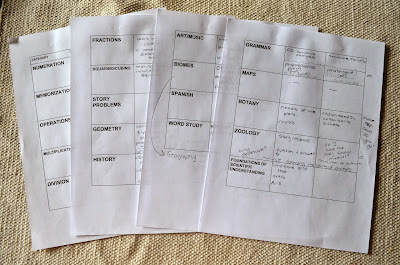 I just found on my own,that I can try to 'pre-plan' when I am going to try to slide in new presentations on the kids, but so much of that ends up changing depending on how smooth our days go, or what they want to do from day to day - I generally find it's not feasible at all to do too much pre-planning as far as specific days to teach something. It just doesn't work out. Then, when we totally don't follow it, it's almost more discouraging for me. I'd much rather see what we DID do, and I like that you keep up with the next presentations/lessons separately so that you are ready for them, as well. 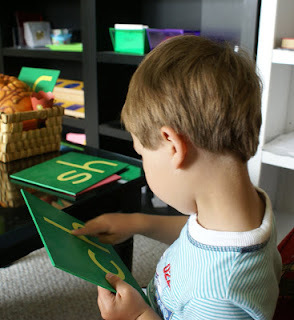 I have been working on a sequence list myself, to use as a guide for what comes next specific to each kid :) love the post - I can always count on a good, informative, helpful read from you MBT :) You do such an amazing job! 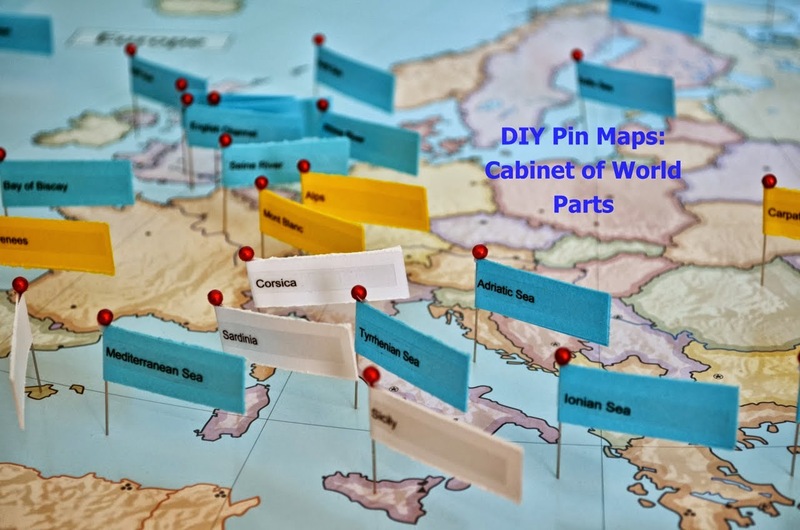 WOW - this is so so so very helpful! 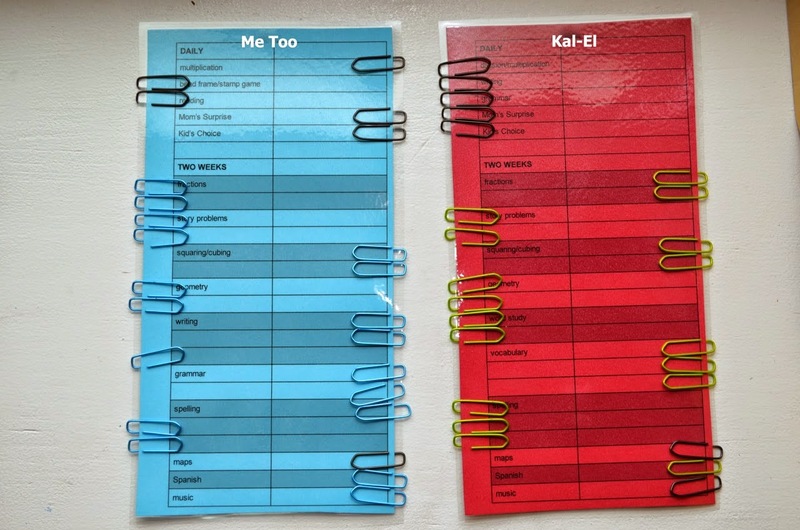 We are just starting elementary and when I introduced the work journal in Kindergarten - I tried several different ways and like you said I feel like it almost "hindered" work in some ways because he did not want to have to write more. I think the idea of a work journal in theory is fabulous, but I may keep it for later in elementary when writing and spelling come more naturally to him. Thanks for your detailed posts. 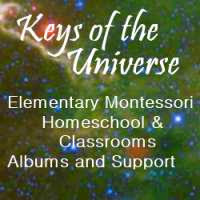 You are my montessori homeschool hero! 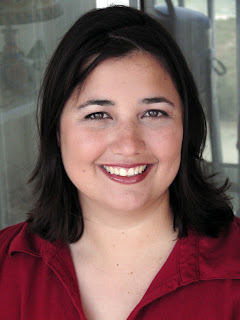 I just started Jessica's class, but had taken Karen Tyler's for primary and have been following your blog for quite some time! Thanks for this, it is reassuring to know that other kids don't like keeping journals either. We had the exact same problem when I tried to get my oldest to record her work, she would not do as much work just so she didn't have to write about it! Now I keep the records. I have just started (really just!) 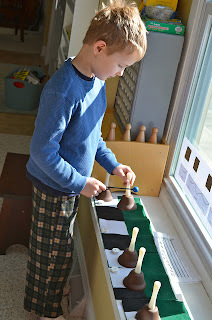 my blog to document my journey learning about montessori. After dabbling in it with my eldest for a while, your blog was the one that inspired me to really go for it with my youngest. I just wanted to say thanks and also that it would make my day if you'd go take a look. I'm really keen to get support there so I can ask questions. Kudos to you. 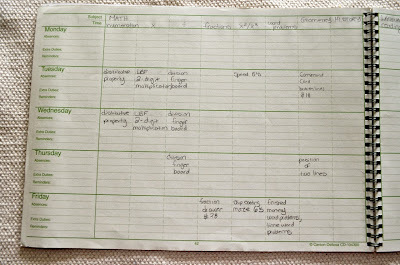 What a great planner and a dedicated homeschool mom you are! I am sure you are an inspiration to many just like to me. Glad that you are sharing what works for you, very helpful! Montessori elementary is a very different ball game and it takes so much effort and constant prep on the part of the guide. It is amazing how you are pulling everything together and keep your boys interested and progressing! Thank you so much for this post. It is just wonderful. What do they say about copying being the best form of a compliment. Please see my article I've just written about copying what you've done and implementing it. I've linked the Word document that anyone can download. Thank you so much again. I started and finished it last night, wrote in my last few days journals and feel so empowered and ordered. Once again, thank you so, so much. So I have the MRD manuals but still find myself at a loss to know what the "next three lessons" are in any given thread. They don't necessarily seem to be written sequentially. Am I missing something? Tootsie, you give me an example? Such as, " I'm looking at the such and such album and the next three lessons described are... "
I'm looking at the Language albums, of which there are four volumes. If we go through them sequentially, then we would go through all the grammar before we get to sentence analysis or punctuation. Another example would be the Geography album. 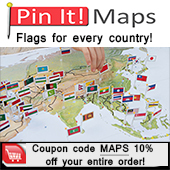 It doesn't seem like we should go through all of political geography before moving on to flags and physical geography. The main problem that I see with using the MRD albums as an untrained homeschooling family is that they are just albums. There is not a lot of guidance. This makes sequencing them tricky. I, of course, have other albums I refer to and my handy dandy KotU course that does explain this stuff. Do you own ALL of the MRD albums? I always wondered if it wasn't all explained somewhere in one of the many albums I DON'T have of theirs. At any rate, Montessori Albums sets are NOT sequential. They are often sequential within a SECTION. However, many SECTIONS run in parallel with one another and many ALBUMS run in parallel with one another. In the MRD the best clues are given as the last couple sentences at the end of SOME presentations. For example in Language volume one, my page 144 at the end of the presentation "THE VERB: 1. Key Experience" it says, "This is an appropriate time to begin activities with ending punctuation." That is your clue, and only clue, to find the volume that has that and start that thread. The album will NOT cue you on how to line up the work as you go. It tells you when to start a thread and it's up to you to keep going. On page 156 in my Language vol. 1 album at the end of "The verb: vi hunt the action" it says, "Note, The Children Begin Sentence Analysis." That is your clue and only clue to start the sentence analysis album (Language Arts vol. 2). Your geography will work the same way. You'll be working in multiple sections of the album concurrently. If you read my post on the way the math threads work you'll notice that it puts you in multiple maths albums at the same time and in several sections of each album at the same time. If you continue to use only MRD albums you'll either have to figure out if there is an overview hidden somewhere (a theory album perhaps?) or start cross referencing the tidbits at the ends of certain presentations like I mentioned AND cross referencing any age ranges given on presentations or on overview pages. For example, the Language Arts volume 1 has a page called "Parts of speech overview" on p. 21 in my album that tells you vaguely which year to give which types of lessons. No matter what albums you have, you will need to read ALL of them from beginning to end before you start teaching so you know when to start what. Thank you for such an amazing response. I really appreciate your time. I haven't seen any theory MRD albums and it sounds like a need one. I don't know if I could adequately cross-reference MRD. Perhaps it is worth getting the Key of the Universe course to help explain stuff. I'm new to all of this. My daughter was in a Montessori school from 18 months to 6 years. We tried a semester of 1st grade public school and that wasn't a good fit. So now we are homeschooling and everything is so new to me. We also haven't grown into it from a young age so we are starting with no resources. I have learned so much from the hours I have spent on your blog. Thank you.